I had the pleasure of attending this year’s New York Fashion Week as an intern. 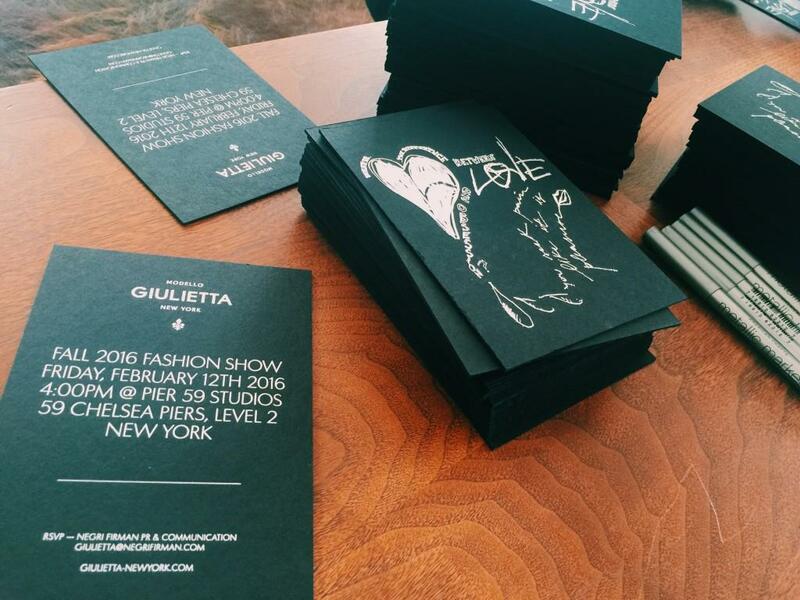 I witnessed behind the scenes the glamorous lives and exclusive showing of Giulietta New York’s Fall 2016 Ready to Wear Collection. Giulietta was founded and created in 2011 by Sofia Sizzi. Sizzi has been a member of the Council of Fashion Designers of America since 2013. She captures the feminine side of fashion with her own taste of 1960’s Italian cinema inspired pieces. I spent the week interning for a company known as Negri Firman PR and Communication. Negri Firman is based out of Milan, Italy, but has a small team that works out of their New York office in SoHo, Manhattan. They represent high end designer brands, such as Giulietta, Attilio Giusti Leombruni, Arthur Arbesser and Costume National — not to mention the view from the office was breathtaking. As I rode the elevator up to the 11th floor, I wasn’t exactly sure what to expect my first day of interning. I walked into a very welcoming, genuine group of women well into their work: sending out samples of clothing to celebrities, answering client emails and preparing themselves for the long, but rewarding week ahead. For most of the week, I assisted one of the full-time interns by adding samples to Fashion GPS, a software service used by thousands of fashion brands to create internal and external communication for magazines, celebrities and socialites borrowing samples of clothing for shoots and events. I even had the chance to preview some of the Pre Fall 2015 Collection. It was so valuable to witness all the hardwork that goes into the fashion industry than what just meets the eye. Throughout the remainder of the week, I delivered and picked up samples and invitations from national magazines, like Cosmopolitan, Harper’s Bazaar, Vogue Italia, People and Woman’s Wear Daily. Knowing that editors, bloggers and buyers from across the world would be traveling to New York to view designer Sofia Sizzi’s self-made collection was all the more reason to make my first impression as an intern in the fashion industry, a good one. On the day of the show, models were in and out of the office for fittings, socialites had chosen what they would be wearing for the show and seating charts were being made. Around 1 o’clock that day, the team of interns and public relations directors headed over to Chelsea Piers to prepare for the 4 o’clock showing of Giullietta’s Fall 2016 Ready to Wear Collection titledHeartbreak Hotel. Sizzi’s collection featured an assortment of metallics, leathers and love letter prints designed by Sofia herself. A recent review on Vogue.com written by Kristin Anderson refers to the collection as rebound worthy pieces. Attendance from about 200 bloggers, editors, journalists and fashion icons filled the black benches at Pier 59 Studios located at Chelsea Piers. I was assigned to set press releases and seating assignments on the benches prior to the show. It was natural that I had a bit of a fangirl moment when I saw I was assigned to section F, seating Leven Rambin of Grey’s Anatomy and The Hunger Games. She was photographed wearing a piece from one of Giulietta’s many Ready to Wear collections. If you look closely, you can see me in in the back…kind of. After the last model left the runway, and the loud roar of applause concluded, the long week of deliveries and assisting had paid off. I had experienced Fashion Week from a first person point of view. I gained valuable skills that will help better my chances for not only another internship, but a job in the future. You have to start somewhere right?